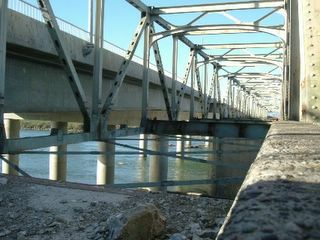 Old Highway 99 bridge across Skagit River is being dismantled. New span bypasses it. Plans call for recycling the steel beams. Bringing them 25 miles north to Bellingham for our new Farmer's Market shelter. That will be an interesting building to see when finished. Saturday, I bicycled to Mt. Vernon and back. About 60 miles round trip. One of the regular followers of my web site lives in Arlington and was planning to come up to Mount Vernon for the day. We arranged to meet on a sunny bench outside Outlet Cafe. Cafe is in Burlington Factory Outlet Mall where she was doing some shopping. I rode back to Bellingham and then went dancing, for a short while, at the Bellingham Leathermen Kickoff Social. It's a new organization starting in town. A lot of motorcyclists, but I am still the only "peddle bicyclist" at the party. Just leaving a comment because you have none. I'm a highschool Freshman in a Computer Lab class. I was just looking for images of Curry County that I could use in a brochure assignment I'm working on. It's not very fun. I came across your site a few minutes ago, something about a bike trip and pictures. Somehow I found my way to your blog. I always find it amusing when I stumble across a stranger's online journal. I didn't read about the bike trip, but I hope it went well.